We had a fab holiday here......However there were a few things that were very displeasing. When we arrived we noticed old food sitting on the BBQ at the pool side, the hotel have a BBQ every Thursday evening....On the evening of the BBQ we noticed that the meat sat out in the hot sun for over an hour before the BBQ was even lit and that the next day the unused food was still on the BBQ. The pool was dirty!!!! we let our kids do the scuba diving and were told by the instructor that he couldn't do a photo as the pool was too cloudy. Not once did I see the poolside washed down. In the pool it self there were loose wires hanging out of the wall, a broken drain and a light hanging by wire in the pool. (this did not stop us from using the pool but had there been an alternative we would have used that instead. The children's club was run by Eric and jasmine who were really good and Kean to keep the kids happy. reception were really friendly too, if we had any problems they were sorted almost immediately. We didn't use the restaurant but the snack bar at the pool side was great value for money. The waiter Manwell was a big hit with the kids but with the adults was quite ignorant, for example if you ordered food and they didn't have it he wouldn't tell you, he would let you sit until you asked again. The hotel rooms are quite spacious but the location is awful!!! Its right next to a swamp, and every day you wake up to the smell of dirty drains in you r room and it is quite sickening. All in all we had a fantastic holiday as we didn't allow anything to get us down, plus there were 3 other families with us which gave us plenty to do. Well what a let down from last year, GERMANS, GERMANS, GERMANS!!!!!!!! Eric is a great child entertainer but is leaving this week so you won't see him. Last year you could get food from the bar until 9 pm now they finish serving at 3pm and you have to go to the dining room which all the tables are reserved and only catered for the GERMANS!!! Almond soup? Had an argument over the football, TV was tuned in for the England match, when we came back from dinner and turned the TV over all the Germans went mad!!! The hotel has to cater for the majority which is 50% German 30% English and 20% other so the Germans got their own way. Manuel is fine with the kids and adults. He works 6 days a week so if he forgets your order then you just have to remind him. Entertainment was poor compared to last year, mainly due to the Germans not buying any drink and going to bed early. If there was not enough people to entertain then the show would be cancelled. Weather was rubbish, 4 days of sun out of 14. Mozzie bites were bad too. Dead ants splattered on the kitchen wall when we arrived. Next day informed reception of ant problem and was given a can of raid!!!!!. Room not cleaned for 5 days. Shame because I really liked this hotel and area but it has gone right down hill within a year and we shall not be returning. 20% Germans were ok, the rest weren't, just incase you think that we have a problem with Germans!!!!!!!!!!! We arrived at the hotel to then find ants everywhere. The reception gave us a can of raid! All I can say is don't bother! On our first full day in the hotel open the wardrobe only to find our clothes were covered in ants ants and more ants! Went to see the receptionist and was given a new room (receptionist wasn't surprised at all about the ants). The lovely aroma that meets you first thing in the morning from the sewers certainly puts you off your breakfast. The room wasn't exactly clean the shower over the bath was rusty and the bath was dirty. This is the second time we have visited this hotel. Having had a really great holiday in 2005 we hoped that this hotel would still be as good. Apart from a few teething problems with the electrics on our first night and having to change rooms twice, which the hotel sorted out with no problems, we were not disappointed. The staff here are all really friendly, polite and helpful, particularly the bar staff and entertainment staff. Our children, aged 6 and 8 enjoyed the nightly mini-disco run by two Dutch girls, Yasmin and Eveline. Their enthusiasm and energy is a credit to the hotel. They also run the daily kids club, morning and afternoon, so mum and dad can laze by the pool! Our son was a bit tearful on the last night as he enjoyed it so much! Entertainment is varied with some being provided by Yasmin and Eveline and some outside professional acts. During our stay, we had Flamenco Dancers, Acrobats, and the notorious Parrot Show. Don't bother with this one unless you really have a thing for parrots! Pool snack bar is good value, for example you could have a ham baguette with chips and salad for under 4 Euros. Cleaning every day except Sunday and Wednesday, sheets once a week, towels every day if needed. Plenty of restaurants within walking distance. We particularly liked, Las Delicias, Restaurante Boy, El Tabal to name but a few. Loads of English bars etc if that's what floats your boat! Not our cup of tea though. Oasis Bar opposite hotel has mini-golf, trampolines and a huge bouncy killer whale for the kids. Reasonable at 2 Euros per child for 15mins. Tried the maze but gave up as we all got hopelessly lost having been in there for well over an hour and a half! Nice and cool way to spend an afternoon though as it is surrounded by pine trees. We must mention the Thomson Rep, Marie who was always game for a laugh and endured being thrown in the pool fully clothed at least twice while we were there! The kids thought she was great! If you are planning a visit here you will not be disappointed, we would definitely visit for a third time in the future. Accommodation - The entrance to the hotel was lovely but what a let down when we got to our room. We were on the 4th floor overlooking the pool, big sun terrace but the rooms are very small and shabby, I am glad there was only the 3 of us. Kitchen area was small but well equipped, infact it was so well equipped there was nowhere to put any food. Wardrobe space was fine but not many coathangers. Bathroom was ok but the toilet didn't always flush and a couple of nights we had brown water in the bath. Beds were uncomfortable too. Maid service is supposed to 5 times a week but she only managed to do ours 3 times. Pool is smaller than it looks on the photos and very deep. Food - There is a restaurant which serves breakfast and evening meal. We had one meal in there but didn't bother going in again as there are plenty of restaurants and bars in the resort. We particularly liked Tapo Giglo, Restaurante Boy to the right of the hotel and El Tabal to the left. Entertainment - There were 2 girls that seemed to work very hard running the kids club and doing some form of entertainment in an evening. Location - The hotel is very central to everything lots of supermarkets, gift shops, bars & restaurants. A word of warning the bar opposite has live music every night which was very loud and didn't finish until 11 - midnight, so if you fancy an early night forget it. Its a 5 min walk to the beach. Across the road from the hotel there is a large play area, bouncy castle, trampolines, crazy golf etc - our son wanted to go there every night which wasn't too bad as at least there was a bar!! Plenty of buses going up and down all day long. Rep - There was no rep on the coach transfer, we had no welcome meeting - infact we never saw a rep until the day before we were due to leave, and she made some excuse that she had only arrived the day before. Good job we didn't need them for anything!! Weather - Out of the week we were there we only had 2 and a half days of sunshine, the rest of the time it was cold, wet and windy. Would I return to this hotel ? No I wouldn't the accommodation was too shabby and basic, but would go back to the resort. Stayed at the Alcudia Suites for 1 week. Stays in the annex at the back of the hotel and the room was the best room I have ever stayed in. It was very very big with loads of room which is good when you have 2 children. Food was good, although was self catering went out for most of the holiday. Staff are very very friendly. While I was there it was my birthday and when I got back to my room later on in the day I had a bottle of wine and a card wishing me a happy birthday from the hotel which I thought was very nice. Although I never told them it was my birthday, I think the cleaners must have seen my cards up in the morning when they cleaned our room. 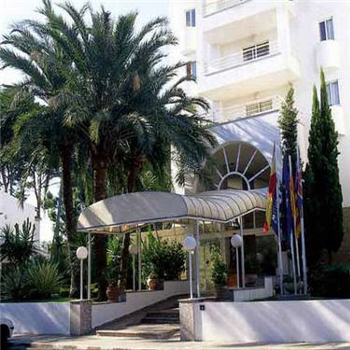 I would definately recommend the Alcudia Suites, and I will definately go back. If you want a great family holiday then this is the hotel for you. We stayed here for two weeks and had a brilliant time. You did have to get up early to get a sunbed, but only so you could put it where you wanted it otherwise you could get up later still get a bed but take potluck where to put it. It was never over crowded around the pool and the inflaterbles were never a problem in the pool. The pool was deep at one end and the paddling pool was fenced off from the main pool. My children are aged 3yrs and 6 yrs and had no problems in the pool. At one point we had to ask ourselfs if it was August as we found these appartments to be very quiet and not over crowded. The apartments were great, everything you needed was in the kitchen which was very modern, and oh yes the cupbords are not that high, my sister-in-law is 5ft 3 and had no problems reaching them. There was plenty of wardrobe space, so don't skimp on your packing, a safe in the bedroom and the rooms are all airconditioned. The maids come every day except Wednesday and Sunday. The rooms were swept and bedding changed twice a week but fresh towels all the time. If you need anything or are not happy then tell the manageress, she is lovely and can't do enough for you. This hotel is about a 1 1/2 min walk across a main road, which is very easy to cross because of a crossing, there is a lovely beach that you can walk out into the sea up to about 100yrds and still only be knee deep which is so safe for kids and the sea is so clear. There are lots of restaraunts everywhere and lots for kids to do( and adults). Go to the Oasis on the corner, they have some great entertainment and the food is lush. DON'T go to SHOOTERS the food is crap and so is the service. The Rose and Crown and The Swan are good for watching Football. There are loads of supermarkets everywhere and gift shops. The entertainment was sometimes good at the hotel. Don,t bother with the parrot show, it only lasted 20mins and 10 of those was spent with them trying to fleece you of 10euros for a photo with the parrot, Tip, if you want a parrot photo the go to the Oasis bar on the corner, there is a parrot outside everynight and the owner will let you have your photo done for free. Everyone is entitled to there own view but I can honestly say that I don't agree with any of the negative reviews on this site. We have stayed in many 3star hotels before and this hotel seemed like a 4star. Tip, ring a week before you are due to arrive and ask for a pool view due to a birthday or something, thats what we did and we had a excellent room with a pool view. Although we chose this holiday to be self catering, the hotel provided good value 3 course meal deals in the evening for around 7.50 euros, very tasty pool snacks and an excellent buffet breakfast for 5 euros per adult and 3 euros for kids, eat as much as you like! Maid service 5 times a week, with clean towels five times a week and change of bedding twice a week. Plenty of activities for kids, Koko Loco Club in the mornings for around one and a half hours giving Mum and Dad peace to sunbathe, and pool games in the afternoon for all to join in and mini disco at night, 8.30 - 9.00. Reception staff very pleasant and helpful with any enquiries.